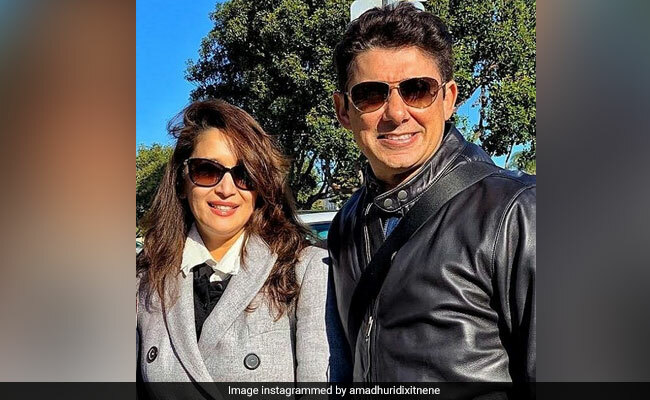 Madhuri Dixit's husband Dr Shriram Nene is celebrating his 53rd birthday today and the actress shared an adorable message for him on her Instagram timeline. In the picture, the 51-year-old actress can be seen standing next to her husband and she captioned the picture as: "Happy Birthday to my best friend and life partner Dr Shriram Nene. Your love encourages and inspires me every single day! May this year be the best one ever. Excited to share many more fun adventures and smiles with you this year and forever. Loads of love." Madhuri Dixit married Dr Shriram Madhav Nene in 1999 and the couple welcomed their first child Arin in 2003. Born in 2005, Raayan Nene is two years Arin's junior. Dr Nene makes frequent appearances on Madhuri Dixit's Instagram timeline. Remember the actress' wedding anniversary post featuring herself with her husband? Or a picture of the family from their vacation in Spain. Kahin na kahin, koi na koi mere liye banaya gaya hai... and this became true when I met this man! Here's to spending a lifetime filled with love, fun & adventures with my most prized possession. Happy wedding anniversary, Ram. Love you! Happy Sunday FacesIt's all about the quality of life and finding a happy balance between work and family! It's gonna be a long flight for a year end family getaway! Can you guess where am I headed? Madhuri Dixit, who made her Bollywood debut with Abodh, is best-known for her performances in films such as Beta, Hum Aapke Hain Koun..!, Dil To Pagal Hai and Devdas among others. Madhuri Dixit is currently busy with the promotional duties of her upcoming film Total Dhamaal. Directed by Indra Kumar, the film also stars Ajay Devgn, Anil Kapoor, Arshad Warsi, Riteish Deshmukh and Johnny Lever. She is also part of Abhishek Varman-directed Kalank which also stars Alia Bhatt, Varun Dhawan, Sanjay Dutt, Sonakshi Sinha and Aditya Roy Kapur. Guess Which Film This Throwback Pic Of Shilpa Shirodkar And Madhuri Dixit Is From?